According to a recent survey, as reported by the Italian news agency ANSA, one out of every three people like to immortalize what they are about to eat with a photo, shifting from a sensation of sight to a more intimate and personal sensation of taste. 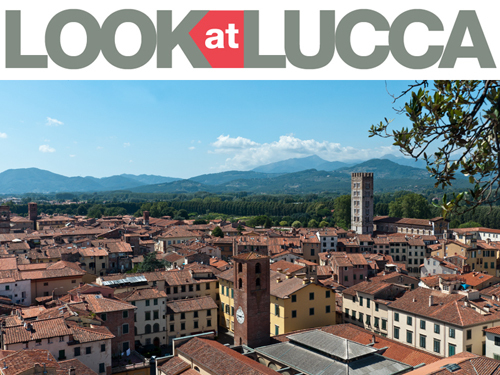 In essence, that is why I believe this itinerary is still perfectly in sync with today: a one hundred percent Lucca itinerary melded in the cultural and culinary microcosm of the many Italian cities that constitute the multi-flavoured and multi-coloured palette of multifaceted Italy. We can therefore compare iconographic elements linked to food that, wisely elaborated through time, have served as instruments to both educate the masses and entertain the wealthy of Lucca. The city has always been a commercial centre, often extremely sacred and pious, yet even very profane and at times, derisive of others’ destitution. 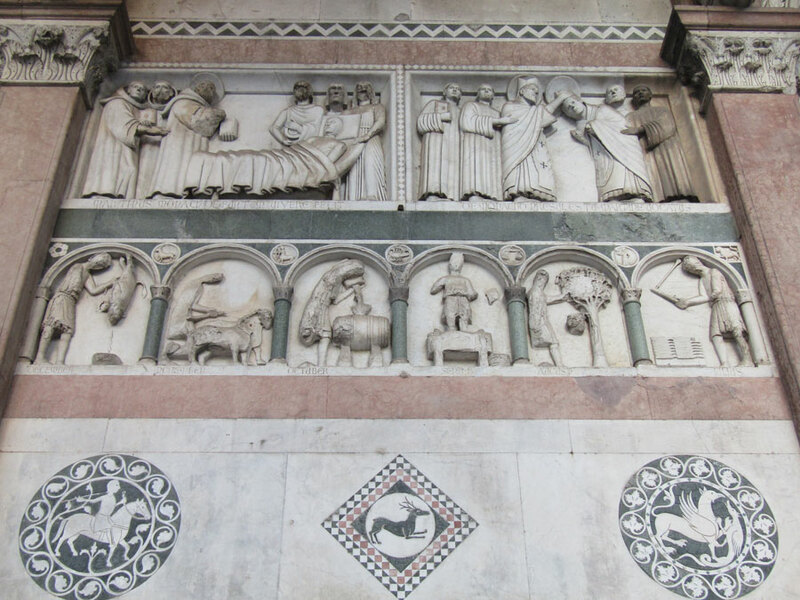 The façade of the Cathedral and the marble reliefs of the portico are an authentic compendium of the life and skills of human beings in the 13th century, subordinate to God’s will, trying to liberate themselves from the difficult struggle to survive as imposed by Nature. To be able to eat is to live. Man is born, lives, and dies by the will of God. At the base of one of the pillars of the three arches supporting the three rows of open galleries of the façade, there is the tree of knowledge of good and evil; the beginning of the human genesis. This is where the first fruit appeared that tempted Eve and condemned both Adam and Eve to the difficult task of the survival of the human race. From here, the plant extends upward just like a vine, and in the upper stringcourses, it appears as an endless series of foliage and fruit. 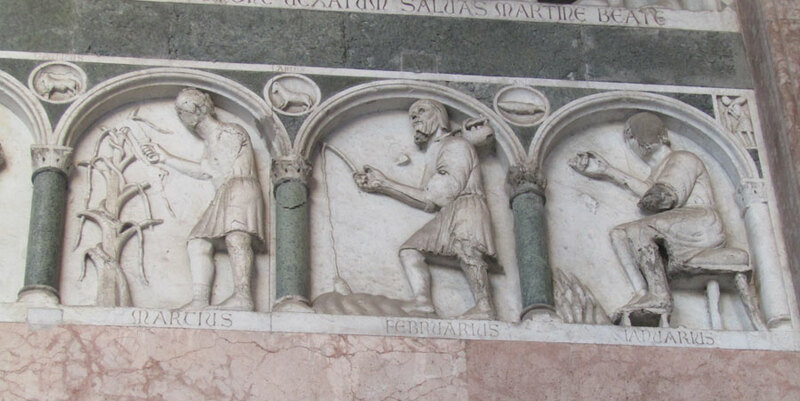 The marble inlay work of skilled sculptors and stone masons from the Como Lake area, headed by the excellent master-builder Guidetto between 1190 and 1211, depicts the hard life of medieval hunters that had to fight hand-to-hand with bears, boars, deer, and wolves. Large game, dangerous animals. These were animals that could constitute a great peril, but also provide a long term supply of food for entire families and large rural communities. According to the city by-laws that regulated commercial activity in Lucca, game meat, often of large size, (today called ‘black’ meat in Italy and France), was always available at merchants’ stalls in the markets of Piazza San Michele. It was also likely to be sold in front of other city churches. In this time period, we can also begin to see the medieval city state finally re-emerge, albeit with difficulty, after the many dark years following the fall, technological and social, of the Roman Empire; years in which Nature once again gained the upper hand over man and the land. Nature, especially in the form of water rather than the regrowth of woods and forests, had reclaimed entire areas that had been drained during Roman centuriation in the alluvial plain between Lucca and Altopascio. Entire fields cultivated with vines and grain in Roman times (the “One Hundred Roman Farms”) were now covered by what was the largest lake in Tuscany, “Lake of Sesto”, six miles from Lucca. The shortage of grains and cereals led to a diet that was rich in fruit and vegetables but, because of hard and toiling manual labour, mainly to a protein-rich diet from animals that could be hunted. Although chickens, hens, geese, and rabbits (white meat) were typical courtyard animals, they would be eaten only on special occasions. Eggs, however, were readily available to almost everyone. Red meat such as ox and beef was rare because oxen were necessary to work the fields and cows were necessary for milk. Thanks to sheep and goat farming in the hills and mountains, in addition to the meat they supplied, cheese production was commonplace. Olive oil was considered to be very precious and a quality product, so, even though it was prevalent, it was used parsimoniously. Meat was usually cooked over the flames of a wood fire but it could also be cut into pieces and placed in clay or copper pots and then cooked. Sauces cooked in pots would be seasoned with natural field herbs like thyme and calamint or with onions and garlic from the vegetable patch. Tomatoes, bell peppers, potatoes, and even chestnuts had not yet been introduced to the area. They arrived in the kitchens of Lucca around the 18-19th century. The spices that we taste today in the medieval panfortes of Siena such as pepper, cinnamon, and cloves, were spices only accessible to the wealthy and very rarely found at the table of the common person. Even salt was used sparingly given the difficulty of communication and sea transport. Nature was, simultaneously, both mother and stepmother. As we move into the portico, we turn a page. Here, sculpted by the same hands but about thirty years after the façade, we find the months of the year describing the manual work of farmers. Here Nature is Mother Nature producing fruit and food thanks to the resourceful hand of man, in turn guided by the supreme divine order that mercifully bestows, moulds, and organizes the monthly cycles of time. Month after month, the various activities unfold before us: the resting period in winter, the pruning and grafting of the vines, the sowing, the harvest, the wine making and the killing of the pig in winter. Of all the activities, it is, without doubt, wine production that has been a constant in the Mediterranean, Italy and Tuscany, through the centuries from the time it was first introduced by the Greeks and, to us in Lucca, by the Etruscans. In those times, wine was produced in great quantities, rather poor in quality, but long-lasting, and able to supply a strong caloric concentration in a small volume. It was perfect in a medieval society where food was perishable, difficult to obtain, and expensive. Everyone drank: women, men, the elderly, and children. There are an infinite number of proverbs in regard to wine. “Good wine makes good blood”, “In vino veritas”, “You can even learn to drink mouldy wine”, “When Saint Martin’s Day (November 11) arrives, the must turns into wine”. And it is this last proverb that draws attention to the 12-13th century equestrian statue on the façade (the original is found in the interior of the Cathedral on the counter-façade). 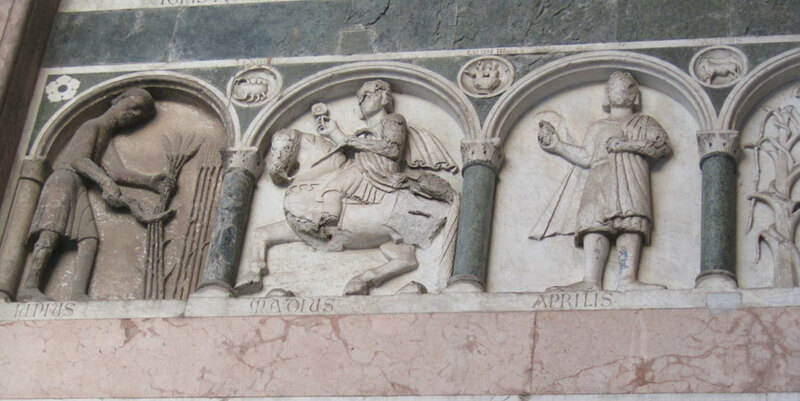 It portrays the Roman horseman Martino (Martin, to whom the Cathedral is entitled) in the process of dividing his cloak in half with his sword. The cloak is a symbol of Martino’s high rank, and he bestows half of it to a freezing cold beggar. November 11 (Saint Martin’s Day) was perhaps the one day of the year that the local population highly anticipated. On that day, by law, innkeepers and wine-merchants could uncork the barrels of new wine and serve the wine to their customers. Should someone have infringed this law, they were subject to both pecuniary and corporal punishment. For the religious celebration, the statue would be clad in elegant and precious silks produced in Lucca and a gold and silver bit would be placed at the horse’s mouth. This statue, according to some of the most reliable reference books, is one of the most incredible sculptures of that time period. Perhaps, it is of Byzantine workmanship coupled with the hand of the master sculptor that created the architrave of the portal of the Baptistery of Pisa. At any rate, it is, most likely, the largest equestrian statue made, or in existence, after the ancient Roman statue of Marcus Aurelius in the Campidoglio, Rome. 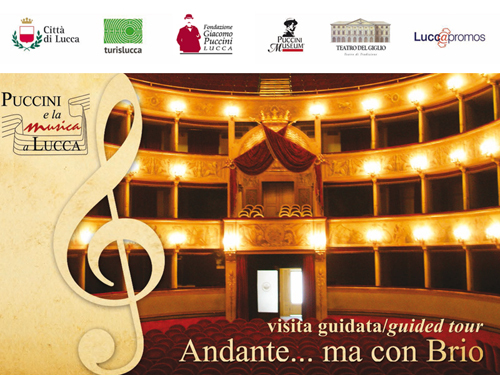 Posted in Blog ed etichettato Art, arts, food, Itinerary, Lucca, San Martino. Bookmark the permalink.